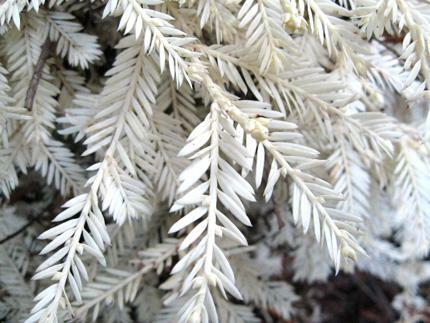 The Albino Redwood is truly a rare find. Among the dense landscapes of California’s redwood forests, you may be fortunate enough to find a tree that doesn’t follow suit of the rest. The tree that we are referring to is the Albino Redwood. Often referred to as “ghost trees,” these trees grow at the feet of redwoods and show off a beautiful snow white color. With a unique lifecycle, these small trees are little wonders. Since they contain no chlorophyll to maintain themselves, the trees rely on healthy trees to glean nutrients from. The Albino Redwood stays small for much of its life and will continue to thrive as long as it has another tree to survive off of. The little trees are a remarkable find, and show just how adaptive redwoods can be. Though there are only an estimated 50 albino redwoods in existence, there are plenty enough to draw curiosity and remind us just how intriguing and resilient nature can be. What do you think of the Albino Redwood?